Why? Why is this happening? I don’t understand why I’m having problems with my writing. I’m finishing folding the laundry now, honey! Writing should be easy. You just think of something and then you put it on the page. Simple. Now, I have the writer’s block of all writer’s blocks. Nothing. My head is empty and my hands can’t even put that to paper. To transfer that vacuum to print would be something. This is the ultimate nothing. Writing shouldn’t be this hard. I’m going take out the trash! Why? Why can’t I write? It’s not like I’m a perfectionist. It’s not like I’m ambivalent. I mean, I don’t like throwing a bunch of inferior crap out there for people to breeze over. I mean, I don’t necessarily agree with the topic of the piece and so I have mixed feelings with the fact it’s going to be published and I’ve got some contradictory ideas about the direction of my craft, but… Oh, I need to sweep the porch. These leaves just pile up quick. Why? Why can’t I write? It’s not like I have time constraints. I mean I have all the time in the world if you don’t count the deadline looming closer and closer and closer… Oh, there it is. Hey honey, I found the pliers! Now I can get started on fixing that lamp. And speaking of constraints, it’s not like I have limited resources. I mean, my internet is out and the library is closed. Why are there so many freaking holidays? It should be so easy. Write, write, write. Come on. It’s not like I have an ineffectual writing process. Have you seen the remote? I mean, I do it like I do it. I think, I surf the web, but that’s out, I read, I think, I wish… I wish I could write this gall-blasted thing. There is literally nothing stopping me from writing. Where did I put the remote? It’s not like I have any unhealed traumatic rejections. I mean other than the letters of rejection for my fourteen screenplays, twelve novels, hundreds of short stories and the one post-it note that accidentally got sent as a rough draft causing my agent to drop me. But I’m way over that. There is nothing stopping me from writing. I don’t understand why I’m having problems with this. I can’t believe this is happening. Maybe I should take a break. You want to grab some lunch, honey? 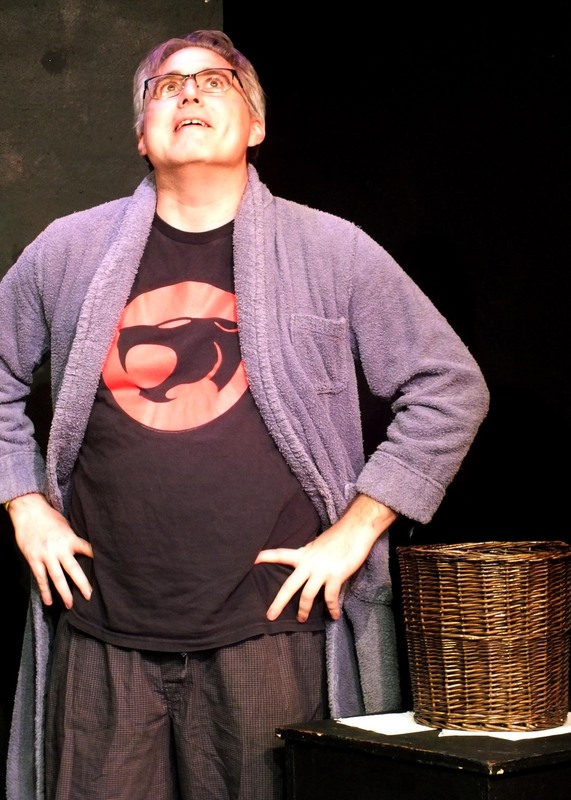 “Writer’s Block” was originally performed by Paul Duffy in the monologue show “We’re No Heroes” at The Eclectic Company Theatre in January 2014. This entry was posted on May 5, 2014 by Eclectic Voices in Monologues and tagged #eclecticvoices, #lathtr, #newplay, #newwriter, Arts and Entertainment, mark bate, monologue, writer, writer's block.